I am amazed at how many people I meet who are clueless about what is going on in this country. They are so busy, so wrapped up in their own personal lives, they do not know that there are cracks in the foundation that supports this country and there are forces dedicated to hammering away at those cracks daily in order to eventually bring America down. I met a new neighbor a few weeks ago who is a perfect example of this “sticking the head in the sand” mentality. During our small talk, when he asked what I do for a living, I explained that I was in the TRUTH business. I told him I was once a mainstream television anchor/reporter who became disgusted with the leftwing bias of the business and now own my own media company. He proceeded to tell me something I have heard hundreds of times before….. that he did not watch the news because there was too much negativity . It brought him down. I asked him if he read or utilized another outlet for gaining information about what was going on in the world around him. He said he chose not to access any news because it was just too stressful. I wonder if he is worrying yet… as his money is becoming less valuable by the day. I wrote this article in response to all the people I meet who tell me they refuse to watch the news, read it, or make any effort to gain knowledge about what is going on in this country. They don’t want to hear about the negative developments and certainly are not getting involved in the process to repair the damage. Living in a state of blissful ignorance is not only foolish, it is irresponsible and inexcusable. The growing number of people who live in this state, are the reason America is being destroyed from within. 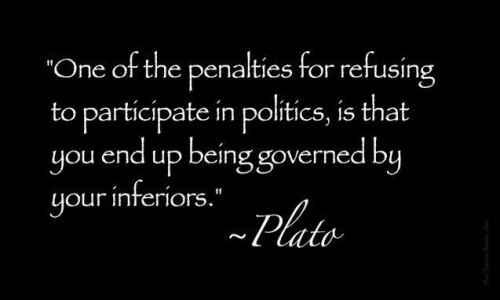 The penalty of refusing to participate in politics is that you end up being governed by your inferiors. Jefferson said, all that is necessary for evil to prevail is for good men to remain silent. I say, “All that is necessary for evil to prevail is for good men to remain IGNORANT AND SILENT. Please read this and share it with the American deadbeats..
Apathy is truly America’s greatest threat. To read more by Jan Morgan, check out JanMorganMedia.com.